The IBM DB2 Integrated Cluster Environment for Linux is a completely integrated, high-performance, and pre-tested solution that incorporates best-of-breed software, hardware, and services. 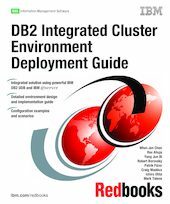 This IBM Redbooks publication provides you with the technical details of the DB2 Integrated Cluster Environment. We begin with a general overview of DB2 Integrated Cluster Environment and the fundamentals of DB2 in a Linux cluster environment, followed by a discussion of hardware options for cluster ingredients that constitute DB2 Integrated Cluster Environment and considerations for their selection. We cover the planning and database design considerations for building a DB2 partitioned database that is both flexible and scalable and provide the implementation details of DB2 Linux clusters. This publication also cover the new autonomic features of DB2 UDB V8.2 and system tools monitoring. It describes components and possible configurations of a high-availability solution and provides implementation details of a failover protection in an DB2 Integrated Cluster Environment. At the end, we discuss scalability in the DB2 Integrated Cluster Environment, including some guidance in planning for the growth of a business and database. We also examine a number of scaling strategies in more detail and provide the steps involved in scaling a database.